After dispersing from this afternoon’s hilarity with Kalinka in the kitchen, I fell into a deep sleep, my feet aching from the cobblestones of Bodrum town. As sweet as the falling into sleep was, the slow-awakening to the fragrant, savory steam of what I later came to know as mantı was even better. Quickly freshening up, I made my way to the upper floors, where M. was already sitting on the counter, chin in hand, watching the manti preparation being handled by Kalinka and supervised by M.’s sister-in-law as close as really strong saran wrap to the edge of a bowl. I can see the ENTIRE troupe of Karagoz puppets lying on their tummies in gender-segregated order from the top of the spice cabinet, folded arms allowing for their heads to watch, tennis-match-like, the preparation process. 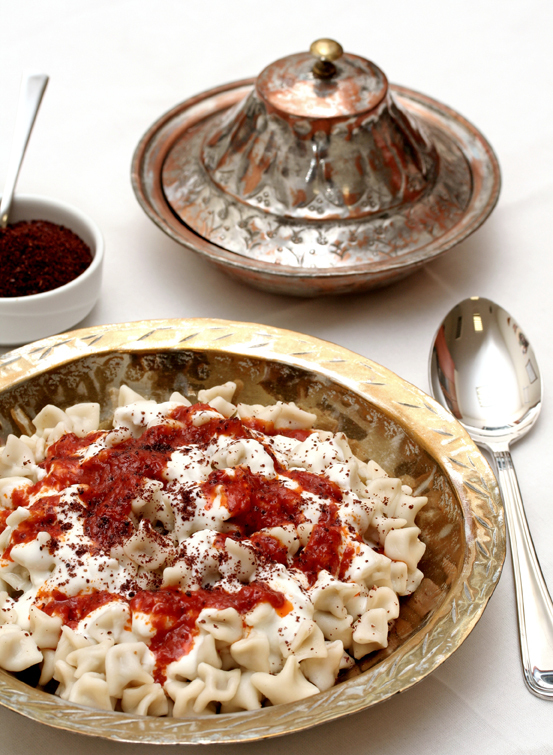 The rolling of the dough, the filling of the packet, the boiling of the mantı. There is not a peep from any one of them, which is highly uncharacteristic. Even Karagöz is wrapped up in the event, and his narcolepsy has not even kicked in. Upon seeing me, M.’s brother jumps up from the counter and leads me by both hands to the kitchen – “come, you must smell this! this is a wonderful smell! this is what we will have for dinner, my wife has worked on it all afternoon.” My mouth is watering, and I am able to ignore my observation that it is Kalinka, not the sister-in-law that has been working all afternoon. “You will have this for dinner,” the sister-in-law says with haughty pride, “it is mouth-watering, first class, haute cuisine, the French have nothing on us. We are not a third-world country, you see, we have CUISINE.” Ignoring his wife, M.’s brother explains the process to me – describing it with words that only the gourmand in him can conjure, he explains that this dish has “peasant roots” from across central Asia. We can barely contain ourselves as the table is set and we spill into our places at the table. Even M.’s usually missing teen cousins are hovering somewhat close to their oh-so-uncool parents in order to not miss out on the possibility of delicious, home-made mantı. I can barely contain my own saliva in this moment, sorry for the graphic, folks, but this is more carbohydrate than I have allowed myself in days given the constant battle on the swim parade front. As Kalinka ladles out the bowls of mantı, M.’s sister in law spoons generous heapings of buttery yogurt with garlic, thyme (kekik) and pul biber (red pepper without the acrid bitterness from the yellow-orange seed as in the U.S.). Nobody says a word, enraptured by the fragrance around us. Even the neighbors call out a wan “afiyet olsun” (bon appetit), perhaps in hopes of an invitation. Although I wait for the hostess to raise her fork before eating, she never does. She does not serve herself, instead retreating to the kitchen to uncharacteristically “take the dishes to the sink.” I see her sneaking serving-spoonfuls of the mantı. She doesn’t notice it, but the puppet troupe have made a mantı assembly line with the remains of the mantı, yogurt-butter sauce and spices left on the counter. I wonder if those mantı will fill them up too much to fold into their waxy selves at night. Mmms and aaaahs abound in the kitchen. No time for me, it is clear. I am on my own. All attempts to remain on par with my sister-at-law are thwarted and I whole-heartedly give in. As soon as M.’s brother begins to eat, I take a first taste. It is unctuous to the tooth, not the al dente of pasta, sort of a gummy firmness which is a lot more appetizing than one might imagine. The meat, full fat of course, is flavored with garlic, salt and pepper in just enough of a way to highlight its natural rich, meaty tones. The buttery yogurt slides around my mouth, and the herbs and spice make my tastebuds pop with abandon. Everyone is happy and smiling, thoughts of Turkish and American obesity vanish for now, and the table is ravaged. All bets are off, it seems, when it comes to a mantı melee! Each of these tiny dumplings is about the size of your fingertip, so you can easily serve 20 to 25 to each person. It’s traditional to invite two or three friends to help fill and seal the manti; after all, many hands make light work. They can be frozen for up to 1 month. 1. Make the dough: Sift together flour and salt in a large bowl. Make a well in the center and add egg. Using your hands, gently draw flour mixture into egg. Gradually add the cold water, and continue to work dough with your hands or a spoon until it forms a smooth paste. 2. Turn dough onto a lightly floured surface. Kneed until dough is smooth and springs back when pressed, 5 to 8 minutes. Divide dough into 2 balls, cover with a damp kitchen towel and let rest at room temperature for 30 minutes. 4. On a lightly floured work surface, roll out 1 portion of dough into a 16-by-10 inch oblong about 1/16 inch think. Using a ruler, cut dough into 1 1/4 inch squares with a pizza wheel or a paring knife. Keep remaining dough covered with a damp kitchen towel while you work. 6. For cooking and serving: Preheat oven to 400 degrees. Coat a 13-by-9-inch baking dish with 1 tablespoon butter. 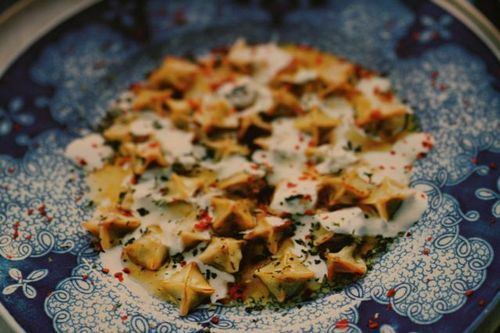 Arrange manti in a single snug layer in the dish. Bake until fragrant and tops and corners are golden brown, about 25 minutes. 7. Meanwhile, bring stock, cinnamon, bay leaves and 1 teaspoon salt to a boil in a saucepan. Remove baking dish from oven, and add enough stock to dish so that all but the tops of the manti are submerged. Cover tightly with parchment and then foil, and bake until soft, about 2 minutes more. 8. Meanwhile, stir together yogurt or labneh and garlic paste in a medium bowl. 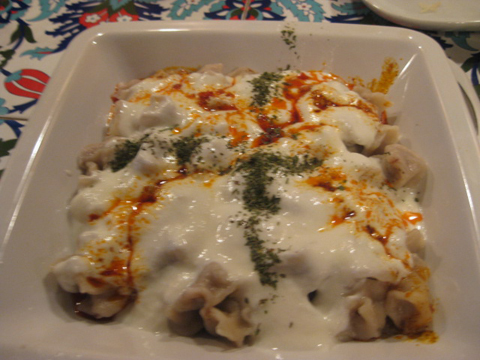 When manti have finished cooking, tile baking dish, collect about 1/4 cup liquid with a ladle, and stir into yogurt sauce (sauce should be spoonable). 10. Divide manti among shallow serving bowls. Spoon yogurt sauce over top, drizzle with browned butter, and spring with mint and red pepper. This entry was posted in Cross-cultural learning moments, Visits from the Karagöz puppets and tagged family, food, household help, manti, Turkish. Bookmark the permalink. at its best, manti is a king! A most enjoyable post ‘Afiyet olsen’ indeed! FHA Loans Offer Opportunity for Lower Income Families.